In my household, summer and popsicle making go hand in hand. The girls and I have a blast creating unique popsicles and of course, eating them together, preferrably barefoot while standing in sunshine. I've been making these for years and have my method down to a science. Get all of my tips and delicious raspberry lime popsicle recipe here! Earth Day is April 22nd but every day is a chance to teach your child to treasure the natural world. Check out my tips for doing just that in this short video! Even the most health conscious among us at least occasionally give our kiddos cake and cookies. Pintrest abounds with rainbow cakes and brightly colored cookies and I'm sure you've seen your share of glowingly bright birthday cakes, but have you ever stopped to think about exactly what is making these colors so vivid? Sorry to bring the bad news, but most of the time it is artificial food coloring giving our treats their colors. Artificial food dyes are made from petroleum. Yep, that means that the same stuff that makes your car run is making your Ninja Turtle cake bright green. Many countries in Europe including Norway, Finland and France ban some or all artificial food dyes. Across the European Union products containing synthetic food coloring are sold with warning labels, but here in the United States we have no such regulations or labels. According to our very own American Academy of Pediatricians, the consumption of artificial food dyes has been linked to ADHD and hyperactivity in children. Recently some big companies have begun to reduce or eliminate artificial food dyes. Mars pledged to phase these out of their products over the next five years and Campbell's Soup Complany and Nestle USA have made similar pledges. While these changes are great there are still thousands of products that will keep their toxic colors. So, what should concerned but busy parents do? First, don't freak out! So far it seems that the dose makes the poison, so if your children eat some synthetic food dye in a cupcake here or a candy there, it isn't the end of the world. That being said, when you are out and about know that most of the time, any colors you see in food products, from sprinkles to ice cream to Nutri Grain bars, and even some you might not notice, like whole wheat pizza crust and pickles most likely come from artificial food dye. Be aware of what your child is eating and do your best to limit the amount of synthetic dye your child eats. Next, control what you can and use natural food dyes in the treats you color at home (I use them in play dough and crafts too!). This is an easy way to have fun with food while keeping your kids healthy. Here are three companies that offer natural food dyes. All three are readily available in stores and online. I first discovered Confection Crafts when looking for natural food dyes to use in my daughter's first birthday cake and I've loved their products ever since. This is a small company based in my hometown of Portland, Oregon and it has a HUGE selection of natural dyes, sprinkles, cookie paints!, and writing and molding chocolate all in a variety of bright, beautiful colors. This is a family-owned company based out of Maine. 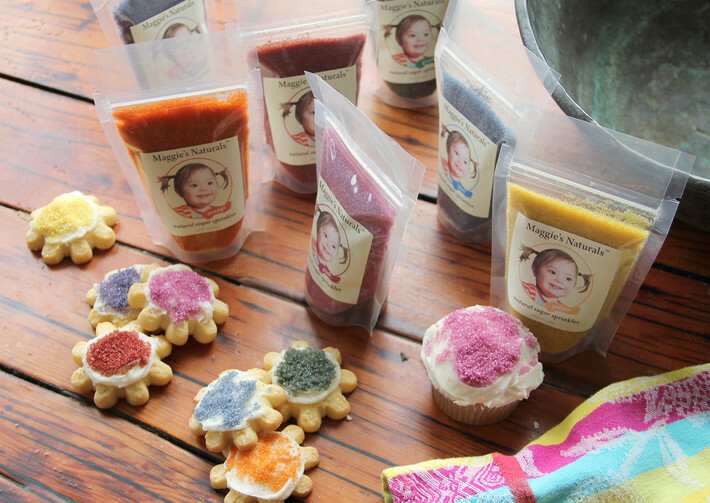 They offer natural food dyes and sugar sprinkles. I've never tried their dyes but their sprinkles are lovely. Based out of Seattle, this is a wide-reaching company whose products are sold across the country. India Tree makes a range of products but I have only tried their natural dyes. I would rate the dyes as just ok. If you have a favorite natural food dye please share in the comments below! Watch the food dye segment here! The cookie party was shot at Village Preschool of Portland, those kiddos are so cute! All of the sprinkles and frosting colors featured are made with natural dyes from Confection Crafts. My kids love bathtime. They splash, they play, they shriek in delight (or despair if they can't agree on toy sharing rules), they insist on helping with the soap and shampoo and sometimes drink (or sip and spit!) the water. Bathtime is a ritual that allows them a last energetic hurrah before the quiet of bedtime as well as some fun QT with mama and dada. When you consider the fact that some of the chemicals we put on our skin end up in our bloodstream, (up to 60% by some estimates) the amount of time our kids spend in the bathtub, sitting in bubble bath, soap and shampoo, adds up day after day, month after month, year after year. I used to think that all cosmetic products were created equally and that it didn't really matter what or which ones I used. Then, when I was pregnant with my first child, I started looking more closely at the beauty products I use, the ingredients that comprise them and the laws that regulate them. Wow was I surprised and alarmed by what I learned. Simply put, the federal law that regulates the use of chemicals in our health and beauty products has not been significantly amended since the Food, Drug and Cosmetic Act of 1938. This act brought the cosmetics industry under the regulatory jurisdiction of the FDA. However, the job of verifying the safety of cosmetic products and ingredients and much of the regulation that takes place is not mandated by law or executed by the FDA. Instead it is voluntary and carried out by the cosmetics industry itself. No health studies or pre-market safety testing are required before a product like bubble bath or shampoo hits store shelves. This passage from the Environmental Working Group sums up the situation: According to the Office of Cosmetics and Colors at the federal Food and Drug Administration, “…a cosmetic manufacturer may use almost any raw material as a cosmetic ingredient and market the product without an approval from FDA.” (FDA 2012) The FDA does no systematic reviews of safety*, instead authorizing the cosmetics industry to self-police ingredient safety through its Cosmetics Ingredient Review panel. Over its 36 years, this industry panel has rejected only 11 ingredients as unsafe in cosmetics (CIR 2012). By contrast, the European Union has banned hundreds of chemicals in cosmetics (European Commission 2012). The bad news: there are ingredients used in our health and beauty products that have been found to be carcinogenic or causing some other risk to human health. Another unfortunate fact is that, because many chemicals on the market have not undergone significant safety testing, not much is known about their effects on human health. This means that companies can use these ingredients and claim they are "safe" because nothing to the contrary has been proven. The good news: not all ingredients are toxic! Also, many of the most toxic chemicals have been identified which makes avoiding them in your cosmetics something that you absolutely can do. Minnesota, Washington and California have all enacted their own regulations to keep consumers safe from toxic cosmetics. If we all keep speaking up about this issue to our own legislators and to the companies making these products we can help to make our cosmetics safer! I chose the chemicals in this list because they are the ingredients I see pop up the most in standard children's bath products. I know how overwhelming learning about all of these chemicals can be, so start here and you will be in good shape! Sodium Lauryl Sulfate (SLS): This is a coconut-derived foaming agent (it makes those shampoos and soaps creamy and foamy) and has been known to irritate eyes and skin. Sodium Lauryl Ether Sulfate/Sodium Laureth Sulfate (SLES): Like SLS, this is a coconut-derived foaming agent and can also irritate eyes and skin. SLES contains the known carcinogen 1,4 dioxane. Fragrance/Parfum/Perfume: I wrote about the dangers of fragrance in my 3Ps post. What is dangerous for adults is typically as if not more dangerous for infants and children, and this is an ingredient full of potential toxins for bodies of any age. There are over 300 chemicals in this class that have never been tested for safety and some have been linked to reproductive and developmental harm. Parabens: This is another ingredient important for everyone to avoid and one of the 3Ps. The EU banned parabens in products for babies under 6 months old and is looking in to further restricting or banning them all together. Parabens can mess with our hormones, and while that is not something that's good for adults, the potential impacts on developing children could be even more severe. Methylisothiazolinone: A preservative used in personal care products, sometimes this one pops up in cleaning products as well. Methylisothiazolinone is an allergen and suspected neurotoxin and Canada and Japan have restrictions on its use. There are many safe brands and products out on the market today which is great news for busy families! The three below are favorites of mine because they are brands that seem to truly care about creating safe products, they are open about their ingredients and work to help consumers understand the ingredients they use, their products work well, and each is easy to find either locally or online. All of Babytime's products are free of fragrances, parabens, phthalates, phenoxyethanol, and petroleum byproducts and some of their ingredients are organic. One thing I really appreciate about this company is that their labels include the chemical and common origins of their ingredients and are color coded by source to help the reader understand the kind of chemicals included in the product, all which makes understanding what is actually in their products much easier. The company makes their products in the USA, is a certified B Corporation, uses solar power and certifies their products as cruelty free and reef safe. Full disclosure, this family opened company is based in my home state of Oregon and I love that about them! Started by a mom in her kitchen, this company has been passionate about and devoted to safe, healthy and effective products for mom and baby since 2002. This is one of the very few companies that I really do trust because they are so committed to transparency in their ingredients and the health of the moms and children who use them. The number of their awards and accolades are to numerous to mention one by one and they continue to set the standard for clean, beautiful and effective products made with care and integrity. I've tried many of their products and have loved every one. When my children were babies and waking up throughout the night I would use the Happy Mama (Morning Wellness) Spray to help me keep my spirits up and I use the Angel Baby Body Wash and Shampoo on my kiddos at bath time. I discovered this company when my oldest was a baby and I still use and love its products (all of which are made in the USA, very cool). Dolphin Organics is a family-owned company, started by a mom, and guided by the input of their "Dolphin Moms." The labels on their products are set up in category columns and clearly labeled so that it is easy to see which of their ingredients are organic, natural, etc. Many of their products follow the strict standards of NSF/ANSI 305, which means a product must be formulated with at least 70% certified organic ingredients, and the remaining 30% materials must be derived from non-GMO agricultural products. I've used almost all of their products over the years and I've never found one that I didn't like. Their bubble bath has great foam and staying power too which can be hard to find in non-toxic bubble bath products. Now through October 30th new customers can get 20% Dolphin Organics products at their online store. Just type in the code INTRO when you check out! Share your favorite green bath products and tips in the comments below! See me in action as the Green Living Expert for More Good Day Oregon! Today I'm discussing tips for taking the toxic 3Ps out of your cosmetics, check it out! Thank you for visiting! The Green Minded Mama is a place for you to find green advice and tips based in both current research and the realities of being a busy family.